What Is He Worth? | ". . . let God be found true, though every man be found a liar." The book of Acts records three missionary journeys in which Paul the apostle was the main character. On the last of these, Paul came to the city of Ephesus in the Roman province of Asia. He spent the better part of three years in this city, teaching and preaching, and also performing what Luke calls “extraordinary miracles” (Acts 19:11). The result of Paul’s preaching was that many of the Ephesians, both Jews and Gentiles, were converted to Christ. When he left Ephesus, he left behind a fully organized congregation under the leadership of elders (cf. Acts 20:17-35). The silver coins mentioned in v. 19 were probably the Greek drachma, which was the equivalent of the Roman denarius. This was the daily wage for a common laborer. Fifty thousand pieces of silver equalled about 137 years’ wages. This was an incredible amount of money, and represented a significant sacrifice on the part of the ones who surrendered their magic books to be burned. More than this, however, this action represented their complete break with their former ways in order to follow Jesus. 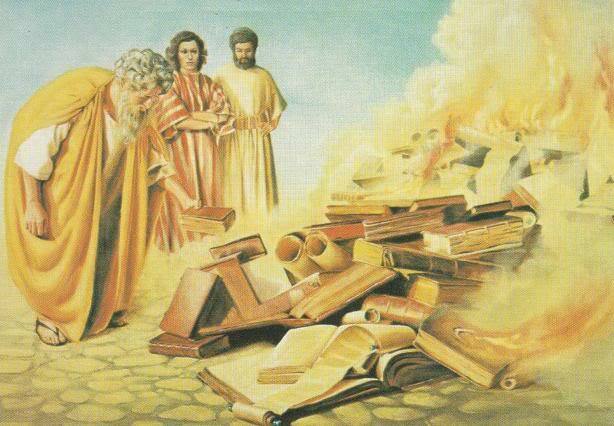 By burning their magic books these new Christians made an emphatic commitment to the new and living way. For these Ephesians, following Jesus was worth giving up everything that reminded them of their former way of life, or which might draw them back to it. The cost of the books each person gave up was nothing compared to what he or she gained by submitting to the will of Christ. The promise of eternal life was so valuable to them that they willing, and freely, destroyed every semblance of their former ways. Their sacrifice raises an important question for modern Christians. What is the Lord worth to us? In other words, what are we willing to sacrifice in order to follow Him? This question is worth serious consideration. The Lord asked it this way: “For what shall it profit a man if he gains the whole world and forfeits his soul? Or what will a man give in exchange for his soul?” (Mt. 16:26). The Lord gave up, albeit temporarily, all the glory of heaven to provide the atonement for our sins. Such a sacrifice and gift is beyond our ability to measure. How then can we continue to cling to the vestiges of our sinful life after having been washed in the blood of the Lamb? Eternal life is worth whatever we have to sacrifice in order to receive it.